You wouldn’t enter Formula 1 in a hatchback, so why would you take on business rivals with outdated technology? The driver is only as good as the car. And no matter how good your ideas, if you haven’t got the technology that will allow you to keep pace with the competition then you risk getting left behind. If you want to increase productivity, improve teamwork, ensure you’re protected against cyber security threats and stimulate your business growth, then you need to think about upgrading your business technology. That said, upgrading your tech can seem like a chore and an unnecessary expense. And if you’re not particularly tech savvy, it can be overwhelming. But don’t fear. The cost and effort of doing so will be recouped many times over by improvements in efficiency and increased productivity. The modern workplace requires us to utilise a smorgasbord of tools and platforms. Whether you’re collaborating with colleagues, creating a presentation, or filing accounts, tasks that would previously have eaten up your time are aided by a suite of intelligent, integrated apps and solutions that make collaboration and file sharing easy. The time and mental energy saved on these tasks can be channelled into growing your business instead. After all, why would you waste valuable people-power and talent on laborious, mind-numbing tasks when they could be done (or aided) by tech? Technology has set us free from our offices. No longer do teams need to be in the same building to work effectively together. But communication remains the lifeblood of an organisation and ensuring information can be shared quickly and effectively is vital for growth and productivity. 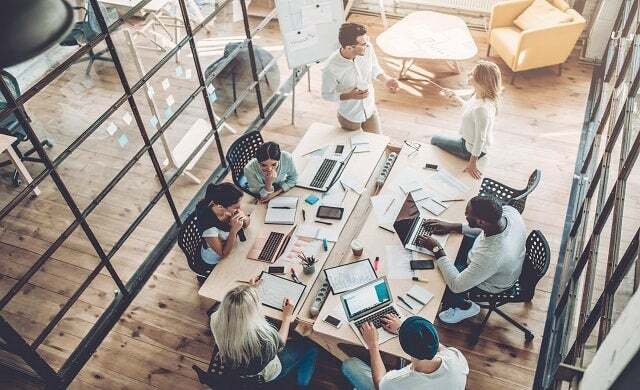 The tools provided by solutions such as Office 365 for Business ensure collaboration and communication remain as effective as if everyone was in the same place. Secure documents can be worked on by multiple people on OneDrive, with edits reflected across all their devices simultaneously. Need to host an important meeting? With HD video conferencing, not everyone needs to be in the office. Digital whiteboards, polls, Q&A and built in instant messaging capabilities enable teams to explore ideas and solve challenges as if they were in the same room. And to make sure everyone is on the same schedule, integrated email, calendars and tasks keep work moving. The cyber-threat is growing as cyber criminals develop ever more sophisticated techniques for stealing your valuable data. This could be anything from spam and malware, to viruses, phishing, ransomware and malicious links. Unlike a smash and grab raid, a digital theft could be done at the click of a button without anyone ever noticing. If you want to have peace of mind that you’re protected against the latest threats, you need to have the latest software. Of course, your business is still exposed to the risk of physical theft. But lost hardware doesn’t have to mean lost data. Built-in encryption capabilities can protect your data against being accessed from stolen devices or enable you to remotely wipe data completely. Business teams are always in flux, and whilst it would be nice to have trust in everyone who’s ever worked for your business it’s not a sensible strategy for security. The latest software allows you to create customisable security policies across your services and even customise security policies for each person. What this all adds up to is a more efficient, well-oiled, business machine. But it doesn’t matter how effectively run your business is if you don’t have any customers. Well, now you can offload some of that workload to digital solutions as well. Microsoft Listings, for example, allows you to easily get your up-to-date business information listed on major sites such as Google, Facebook, Bing and Yelp. What’s more, you can get a feel for how customers are responding to your business by tracking views, reviews and ratings from one simple dashboard. Despite the ever-increasing dominance of social, email remains a powerful marketing tool for small businesses. Now it’s easier than ever to encourage referrals from your current customers and offer them rewards for doing so. Again, you can monitor the effectiveness of campaigns by tracking metrics such as open rates, click rates and sign-ups. Microsoft Office 365 for Business provides all the tools you need to give your productivity a boost, including a suite of tools and programmes to improve workflow, ensure your team is working better together and protect your sensitive business data from cyber security threats.